AMD line of processors by AM1 we once fully tested , but with the connector boards are not concerned at all. The reasons are simple: it was originally fiscal platform, a socket is generally dictated by the performance of a desire to saturate the market, and the functionality of the finished products are mainly determined by the capabilities of CPUs, which have already become a SoC. Accordingly, the manufacturers have no incentive to release the outstanding fees – the majority is a model of Mini-ITX format without any additional controllers, t. E. Essentially a passive connector processor and other peripherals. On the other hand, absolutely ignored this market more wrong – it is reasonable to give potential customers at least some idea of what they will face when choosing a platform. What we have decided to make an example of one of the typical models for AM1. 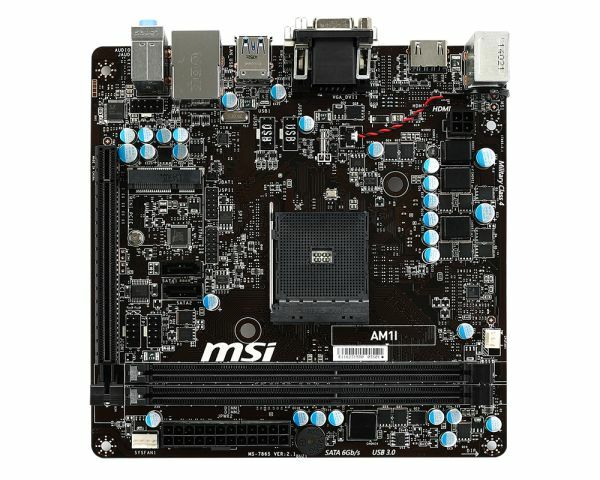 Summary table of the characteristics of the board MSI AM1I listed below and hereafter we will consider all of its features and functionality. 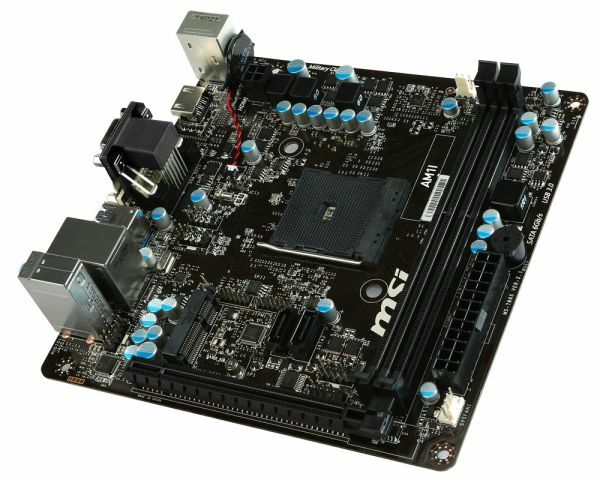 Fee MSI AM1I made in the form factor Mini-ITX (170 × 170 mm) and can be installed in a housing which supports the board with a form factor Mini-ITX or large in size. To mount the board has four standard holes. As already repeatedly mentioned, all the devices under Socket AM1 are systems on a chip (SoC), m. F., And include its own processor, and the full functionality “chipset”. To install the memory modules on the board has two DIMM-slots, even more redundant, since all the processors for AM1 support only one memory channel. Accordingly, the second connector can be useful only for its expansion, the benefit of the maximum supported capacity is 32 GB, but suitable for its production units on sale yet. Officially supported modules DDR3-1333 / 1600, which corresponds to the specifications of processors, but it is possible and the use of lower frequency modules. Note that overclocking the memory on this platform is not provided, in principle, with the exception of the base rate increase, but this board is not implemented. As a result of senseless supports XMP profiles, and the ability to adjust memory voltage in the range of 1.3-1.8 in the same useless, since you can only reduce the frequency up to 800 MHz, but do not improve. SoC Kabini support up to eight lines of PCIe 2.0, part of which can be combined to support a slot PCIe x4. 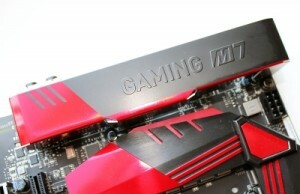 Such a board is implemented, but has physical performance PCIe x16, which improves compatibility with the expansion cards – perhaps even the use of discrete graphics cards. For most processors, however, do not need it, but in the family, and now there are two Athlon X4 with a locked video core with which to experiment and (especially in the presence of the previously purchased the video card, the built-in level above the other APU Radeon R4). The highlight of the card is the presence of a second expansion slot, although it is not provided for the format Mini-ITX. Fooling the “laws of nature” was possible thanks to the existence of connectors such as Mini-PCIe, which is present on the board. Its presence is particularly appreciated by those who choose to provide computer support for wireless network – to find an adapter in the form of a Mini-PCIe half-length is even easier than in the version under the “adult» PCIe. To connect monitors and other display devices on the rear panel are ports HDMI 1.4 (a maximum resolution of 4096 × 2160 @ 24Hz or 1920 × 1200 @ 60 Hz), DVI-D (Single Link – 1920 × 1200 @ 60 Hz) and VGA ( D-Sub). To connect hard drives or optical drives on board has two SATA 6 Gb / s, which are implemented on the basis of integrated into the APU controller. 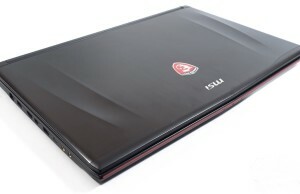 Against the background of the capabilities of modern chipsets that seems significant limitation, however, in practice it is not, because most computers (particularly inexpensive and compact) and is now provided with a drive (rarely two). 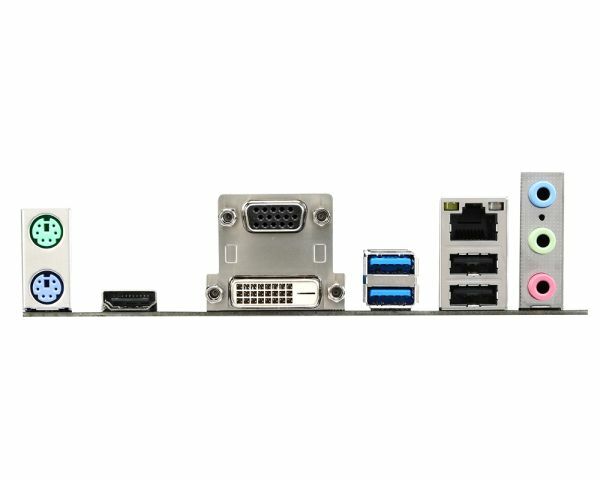 To connect all kinds of peripheral devices on board has two USB 3.0 ports and six ports USB 2.0.As you would expect in this situation, both USB 3.0 ports and two 2.0 on the rear panel and four USB 2.0 ports are available in the form of combs on the PCB. This implies two drawbacks. Firstly, “in flight” are those who want to install an internal card reader to the chassis with USB 3.0 interface, or simply withdraw any ports on the front surface of the body – connect matching accessories nowhere. Secondly, only four USB-ports on the rear panel for these days seem to be clearly insufficient quantity, but with additonal fee for compact (especially low-profile) enclosures is not always a trivial task. Correct the situation, however, you can use the mouse and keyboard with PS / 2, good board is equipped with not one, but two such ports, but that if they have (from the sale of devices with outdated interfaces are gradually disappearing, and in the segment of high-end solutions this happened for a long time and for all). And this is clearly not related to the theoretical deficit ports – eight supported APU USB 2.0, again, diluted only six. A curious feature of the board, which may well please the owners of outdated peripherals, is the presence of internal COM. Unfortunately, the bar for bringing out its complete missing, but in general, it is worth a penny, and may already be available. To connect to a LAN segment on the board implemented a gigabit network interface controller-based Realtek RTL8111G – almost a de facto standard for low-cost motherboards. Like most motherboards for this platform, this is a 24-pin and 4-pin connectors for the power supply. CPU voltage regulator on the board is a three-channel. 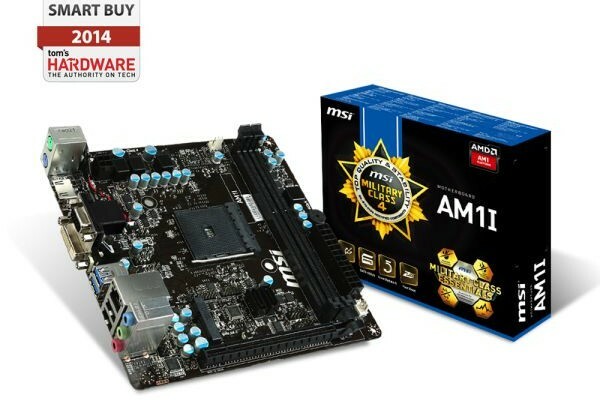 All components are inexpensive, but nevertheless, MSI does not forget to mention the use of solid capacitors, coils and other black «Military Class», which has become habitual. Again, as expected, support for analog audio is realized on the principle of “make it”: already used the old codec Realtek ALC887, who “in his lifetime,” the standard of sound quality was not.Formally, it supports 7.1 speakers, but because of the presence on the rear panel of only three audio jacks to connect it only while harnessing both them and the front output housing. However, we believe that conventional systems of this level is to use a pair of cheap speakers, and no more, but if suddenly someone will need high-end speakers, for its connection has long been used successfully HDMI. The main goal of the development platform AM1 was to strengthen positions in the budget segment of compact low-power solutions. Moreover, all three words in this case both are key – If any of them drop, competitors might be preferable. The need for strict compliance with the three not very good to combine the requirements of making the platform a niche solution. A fee for it automatically becomes very simple and “uninteresting.” Indeed, manufacturers attempt to significantly improve the functionality instantly increases the price, so that the possibility of providing solutions based on, for example, the chipset Intel H81, and we get a similar price tag, which is unlikely to please the potential buyer. 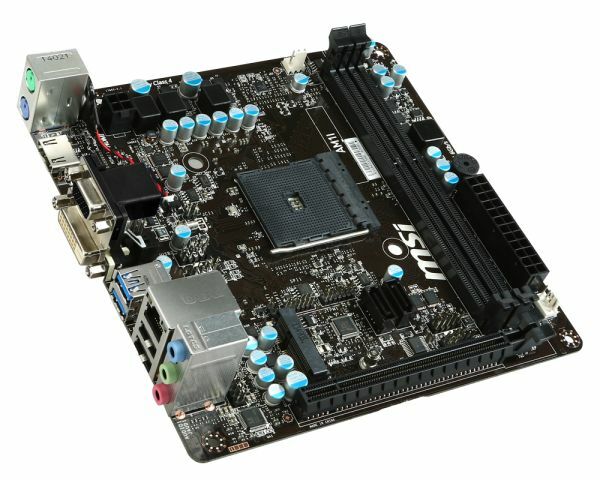 So, in fact, no one rushes to engage in this – all the boards for the platform similar to each other like identical twins 🙂 MSI AM1I – a typical representative of this direction: Boards Mini-ITX, limit functionality SoC Kabini and designed for use in standard Computer case. A need such a card or not – depends on whether you need the platform as such.